The internet really is a fantastic resource for craft tutorials and tips. I continue to be amazed by how easy it is to become a largely self-taught crafter, and to find resources which are (by large) free. I've been expanding my skirt drafting skills a lot recently, in the interests of being able to widen the styles I can offer on my etsy shop, and I've found quite a few drafting guides that are relevant whether you are a size 0 or 34. I don't buy many patterns these days - I largely adapt the ones I have, and spend my time researching how to drafting my own instead, as it's much more cost effective in the long run. Here are a few size-less drafting guides for skirts. Skirts (in my opinion) are easiest to start with, as with full styles (circle, a-line, pleated), you only really have to fit around the waistband. How to draft an a-line skirt from your measurements. How to draft a circle skirt (with bonus spreadsheet for all the tough calculations! How to draft a pencil skirt. Super cute curved pockets - a fantastic 50s-esque detail to add! As a DIY seamstress, I find the resources available online incredibly inspiring. I rarely have to consult the craft books I own anymore - googling tutorials tends to be much simpler and easier to follow (I am not great at following written instructions, so step by step pictures, videos and so on make much more sense to me). 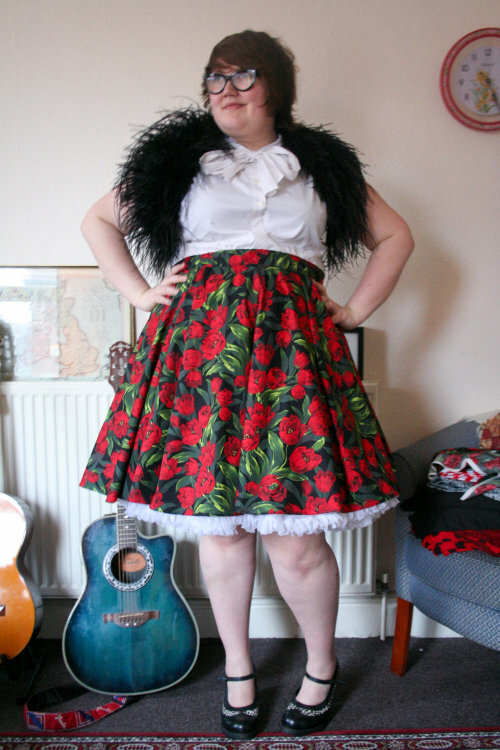 I also find I am significantly less reliant on the patterns available for plus sizes (pretty appalling all round), and more capable of making exactly what I want to own this way. It's been a good while since I first bought this dress, but it still remains one of my favourite daywear items. I wore this on Saturday to go to Bradford with a friend, buy some zines from a fair and eat curry (a pretty good combination in my opinion!). I dug this necklace out of my jewellery box the other day when I was having a sort out - it was pretty much my favourite accessory all through my final year of university and I'm not sure how or why it got buried. It's a nice tough to add to an otherwise quite simply outfit. Also, yes, apparently it is necessary to shoot the close up in front of my favourite creepy child painting (bad art is a kitsch love of mine, and this was a £3 charity shop buy). After taking a whole bunch of pictures today, I came to the conclusion that I pretty much always look awkward posing with a satchel. Here's my typical errand attire of late, now that Spring has arrived in Yorkshire. I went out in three layers today and ended up sweltering! Here's hoping the sun stays and I can stop wearing tights constantly. I'm wearing one of my finds from the Plus Sized Clothes Swap I co-hosted on Sunday - a sheer Edwardian-esque top! I had a great day, and completely failed to document it (of course), so if you're interested in pictures from the day I'll direct you to this post on Lolly Likes (who has great style!). We had an increase in turn out from last time, which was fantastic, and it was great to see lots of returning faces also. We're wanting to continue doing swaps and start a fat positive collective in Yorkshire - if you're interested in participating you can now join our facebook group here. Anyone is welcome to join and suggest activities, share resources or admin on the community. We also run an email list for the clothes swap, so if you'd like to be added to that you can email me at fattyunbound [at] gmail [dot] com. If anyone has any feedback on the swap, you can contact me via the same email. I'll be showing off some more swap items as the week goes on! p.s. My giveaway with the lovely B.A.I.T footwear closes tomorrow evening, so get your entries in ASAP! Find full details on this post. This was an errand runing outfit from earlier in the week. I love this skirt, but the length is definitely odd for me - I always feel a little frumpy in it, because I normally wear mid thigh skirts. I'm wearing it more now though, as the bright yellow is such a Spring colour. A bit of a colour/pattern/everything clashing yesterday, inspired by occasional bursts of bright sun and just the general need to be a bit obnoxious and loud. I love these tights but feel I need to make a few bolder wardrobe decisions in teaming them with outfits. This weekend is the plus sized clothes swap I'm organising - you can see details for that here, and there's a facebook event here too. It'll be fun and cheap and awesome! Also, don't forget to enter my giveaway with BAIT footwear, details here. Another plug for you all today, SORRY. Everyone knows that I've been making clothes for a while now, and this past month I've been spending a lot of time getting my grading skills up to a good standard. I've made the decision to start selling custom made circle skirts (half and full, in a variety of printed cotton fabrics) on etsy. I cater to any size for the prices listed, and there are other pattern options available (including some super cute bird prints!). If you're looking for a plain cotton, or perhaps a different pattern, you can also convo me and I'll see if I can source something for you (though this might incur extra costs). There are currently four listings on Etsy - two custom listings and two ready to ship (the above two skirts, which are both best for a 20/22). Head over to my etsy shop for further details. An everyday sort of outfit today - these pieces are pretty much my staple wardrobe items. I think you've all seen them countless times before, but maybe not together in this way. I've been thinking lately about my wardrobe habits. I'm pretty impulsive with my shopping, and it always means that my clothes storage is full to bursting. However, at the same time, I wear pieces like these to death, and I find that day to day, I keep to staple basic separates nowadays. This didn't use to be the case - I used to wear dresses and cardigans constantly (hello twee past), and I found that my wardrobe contained lots of dresses that I circulated regularly. Now my dresses are more for special occasions, and I am much more of a remixer of clothes. This month I’m teaming up with my newest sponsors, But Another Innocent Tale Footwear, to offer you all a giveaway! 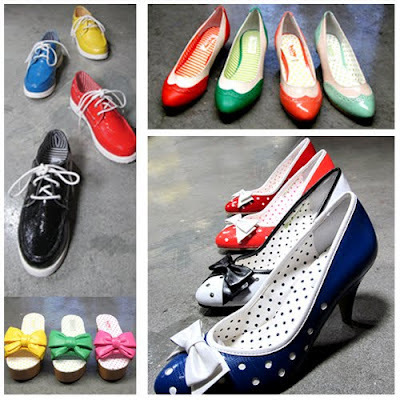 B.A.I.T are a very newly launched footwear company, who offer vintage inspired shoes, with modern details and colouring. Their styles are colourful, affordable and lovely compliments to a retro styled wardrobe. Their shoes are perfect staples for any wardrobe, and I have to say that, as someone who loves pieces to mix and match, the colour range appeals to me endlessly.They’re a brand that appeals to me so much right now, with Spring approaching, and the thought of summer days not too far away. But Another Innocent Tale have kindly offered to give one of my readers a choice of shoe from their online store. Visit the B.A.I.T footwear website, and check out their shoe selection. In the comments to this entry, let me know your favourite style name and colour, and don’t forget to leave your email address, so that we can contact you after the giveaway ends! The giveaway will run until 29th March 2012 after which I’ll announce the winner on the blog and contact them directly. I spent this past weekend at All Tomorrow's Parties in Minehead, enjoying the cold weather (with occasional bursts of sunshine! ), the beach and seeing lots of bands that I love dearly. As per usual I got carried away and forgot to document my outfits, but I did have a chance to have a hunt around Taunton's (MANY) charity shops on my way home. 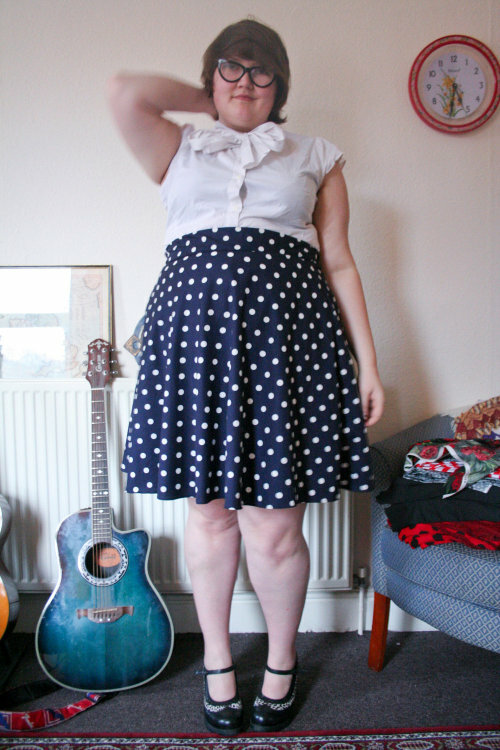 I was lucky enough to pick up these high waisted polka dot shorts in one of them, which is pretty exciting as I've been after a pair for ages. These are really wide with a semi elasticated waist, and just the right length - I had a pair before, but they were pretty indecent even with tights on (curse long legs), so I swapped them a while back. p.s. I'm going to be hosting my first giveaway soon, keep an eye out for more information this evening! I'm certain anyone who follows more than one fat fashion blog will have seen this dress by now - it's from New Look Inspire, and has proved pretty popular. Having read a few rad reviews, I decided to buy it when it went into the sale recently (it's sold out now), and I'm glad I did. I'm a big fan of simple jersey dresses for daywear right now, and the cut and big pockets make it pretty good for errand running. I sized down to a 20, because it was all that was left online, and am glad I did as it's pretty generous, and nice and form fitting now. It'll definitely be reworn! After seeing suspender tights and hold ups as outerwear around so much lately, I decided to give it a go myself. Hold ups and mini skirts were pretty much my riot grrrrl teenager togs of choice, so I'm considering this a slightly more adult attempt. Funny though, how, despite wearing more tights than I would normally wear, I felt self conscious in this - completely nonsensical. These hold ups, as a side note, as Autograph brand by M&S, and can be found here. I've owned maybe three pairs in the last three years, and they last FOREVER. They're also the only hold up I've ever gotten along with - they've got height enough to sit right on my upper thighs, never fall down and have a nice, thick band. Okay, £9.50 is a lot for a pair of hold ups, but I reckon with the amount of times I've worn them, they probably cost pennies per wear now.